Albanese, C. 2007. A republic of mind and spirit: A cultural history of American metaphysical religion. New Haven: Yale University Press. Barge, F. 1990. One Cause, One Cure: The Health & Life Philosophy of Chiropractic: La Crosse Graphics. Beckman, J, C Fernandez, and I Coulter. 1996. “A systems model of health care: A proposal.” J Man and Phys Ther no. 19 (3):208-215. Beideman, R. 1996. 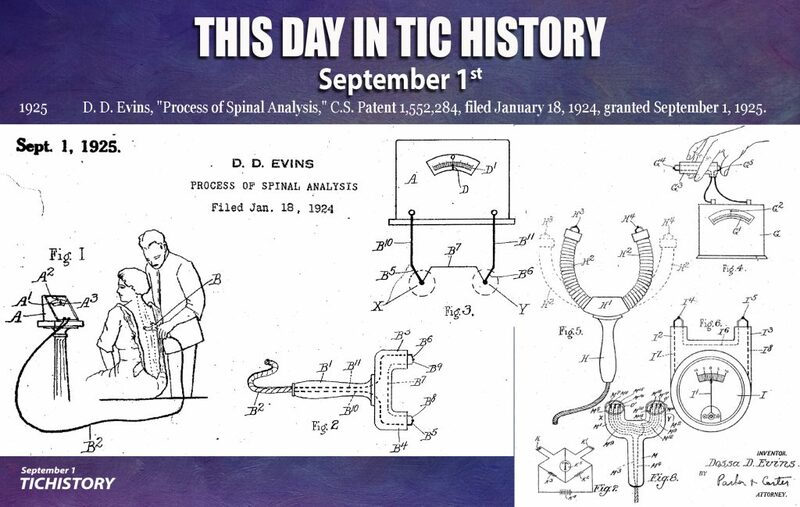 “The role of the encyclopedic Howard System in the professionalization of Chiropractic National College, 1906-1981.” Chiropr Hist no. 16 (2):29-41. Bittner, H, WD Harper, AE Homewood, J Janse, and C Weiant. 1973. 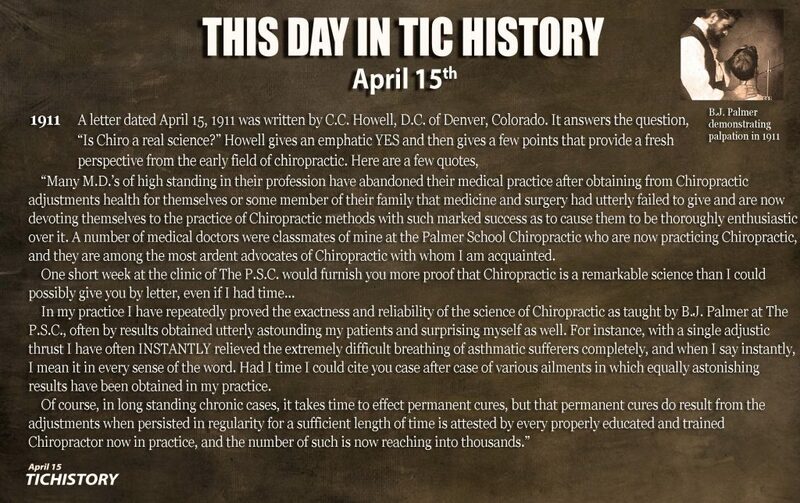 “Chiropractic of Today.” The ACA Journal of Chiropractic no. VII (S-82). Boone, WR, and GJ Dobson. 1996a. “A proposed vertebral subluxation model reflecting traditional concepts and recent advances in health and science.” J Vert Subl Res no. 1:19-36. Boone, WR, and GJ Dobson. 1996b. “A proposed vertebral subluxation model reflecting traditional concepts and recent advances in health and science: Part II.” J Vert Subl Res no. 1:23-32. Boone, WR, and GJ Dobson. 1997. “A proposed vertebral subluxation model reflecting traditional concepts and recent advances in health and science: Part III.” J Vert Subl Res no. 1:25-34. Burich, SL. 1920. Chiropractic Chemistry. Vol. 11: Palmer College of Chiropractic. Carver, W. 1936/2002. 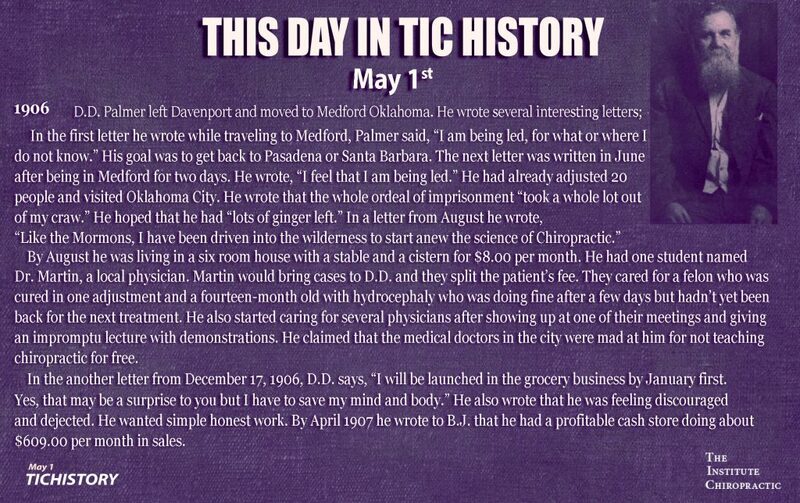 History of chiropractic. Edited by J Keating: National Institute of Chiropractic Research. Cleveland, A, R Phillips, and G Clum. 2003. “The chiropractic paradigm.” In Fundamentals of chiropractic, edited by D Redwood and C Cleveland. Cleveland, CS. 1951. Chiropractic Analysis: Symptomatology Outline. 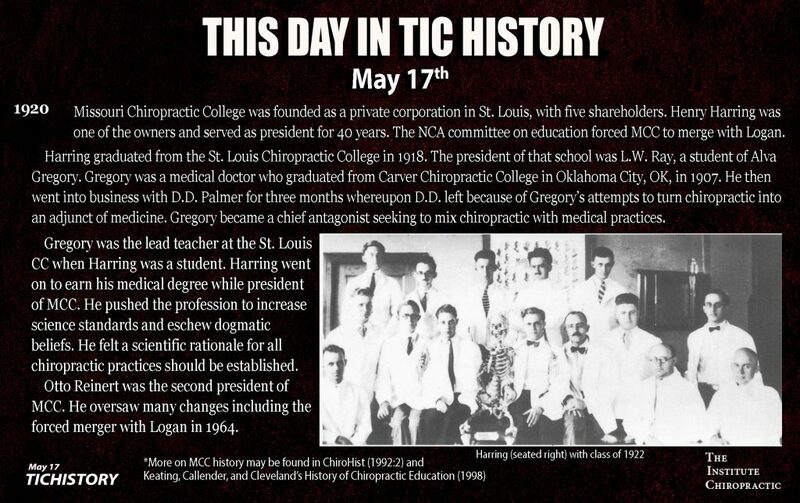 Kansas CIty, MO: Cleveland Chiropractic College. Clum, G. 2007. “Philosophy of chiropractic: Its origin and its future.” J Chiropr Human. College, Sherman. 2010. “Dr. Bill Decken Receives ICA Award.” Sherman Shares – July 2010. Collins, R. 1998. The sociology of philosophies: A global theory of intellectual change: Harvard University Press. Coulter, I. 1991. “Chiropractic philosophy has no future.” Chiropr J Austr no. 21 (4):129-131. Coulter, I. 1993. “Metaphysics, rationality and science.” J Man and Phys Ther no. 5:319-26. Coulter, I. 1999. Chiropractic: a philosophy for alternative health care. Woburn (MA): Butterworth-Heinemann. Davis, AP. 1915. Neuropathy Illustrated: The Philosophy and Practical Application of Drugless Healing, Amply Illustrated and Explained: Graves & Hersey. Donahue, J. 1989. “A proposal for the development of a contemporary philosophy of chiropractic.” no. 2 (2):51-53. Donahue, J. 1990. “Philosophy of chiropractic: Lessons from the past – guidance for the future.” J Can Chiropr Assoc no. 34 (4):194-205. Drain, J.R. 1956. We walk again. 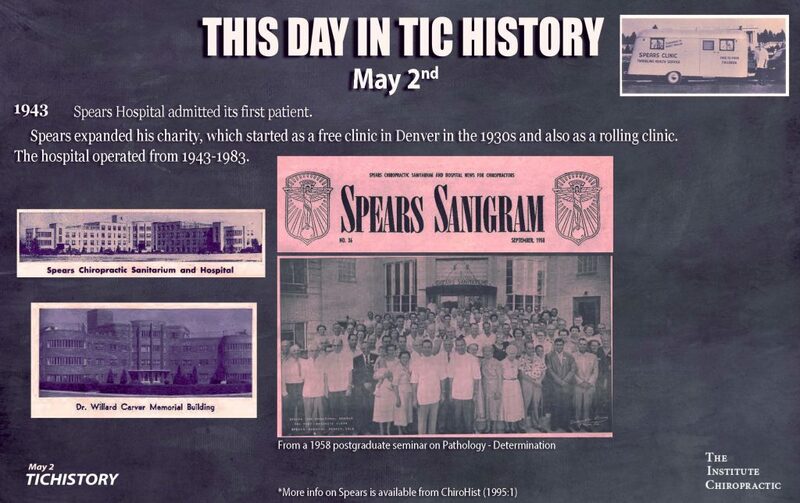 In Spears Papers, edited by Cleveland College Archives. Drain, JR. 1927. Chiropractic thoughts. San Antonio, TX: Standard Print. Company. Drain, JR. 1949. Man tomorrow: Standard Print. Company. Ebrall, P. 2016. “Commentary: Is EBM damaging the social conscience of chiropractic?” Chiropractic Journal of Australia no. 44 (3):203-213. Epstein, D. 1989. Palpation as a critical tool to detect, classify, and understand central nervous system pathological dominance and the correlation of these findings to various models of vertebral subluxation. In Academy for Research in the Chiropractic Sciences. Philadelphia. Epstein, D. 1990. The human organism as a dissipating structure. 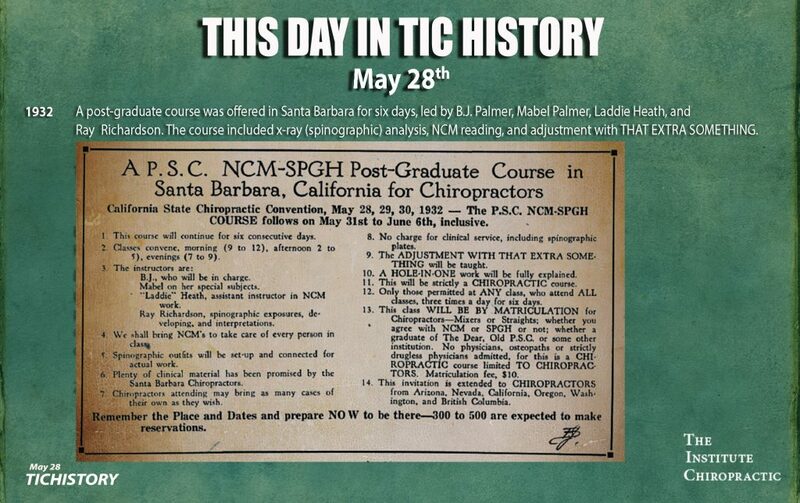 Paper read at Network Chiropractic Seminar: Module F, April, at Monterey, CA. Epstein, D. 1994. The Twelve Stages of Healing: A Network Approach to Wholeness. San Raphael, CA: Amber Allen. Epstein, D. 1995/2005. Theoretical Basis and Clinical Application of Network Spinal Anaylsis (NSA) and Evidence based Document, rev. xi. Longmont, CO: Innate Intelligence. Epstein, D. 1996. “Network spinal analysis: A system of health care delivery within the subluxation-based chiropractic model.” J Vertebral Subluxation Res no. 1:1-9. Epstein, D. 2004. “The transition of network spinal analysis care: Hallmarks of a client-centered wellness education multicomponent system of health care delivery.” J Vertebral Subluxation Res no. 5:1-7. Epstein, D, SA Senzon, and D Lemberger. 2009. “Reorganizational Healing: A Paradigm for the Advancement of Wellness, Behavior Change, Holistic Practice, and Healing.” JACM no. 15 (5):475-487. Faulkner, T, J Foley, and S Senzon. Forthcoming. The chiropractic green books: A definitive collector’s guide. Asheville, NC: The Institute Chiropractic. Faulkner, T. 2017. 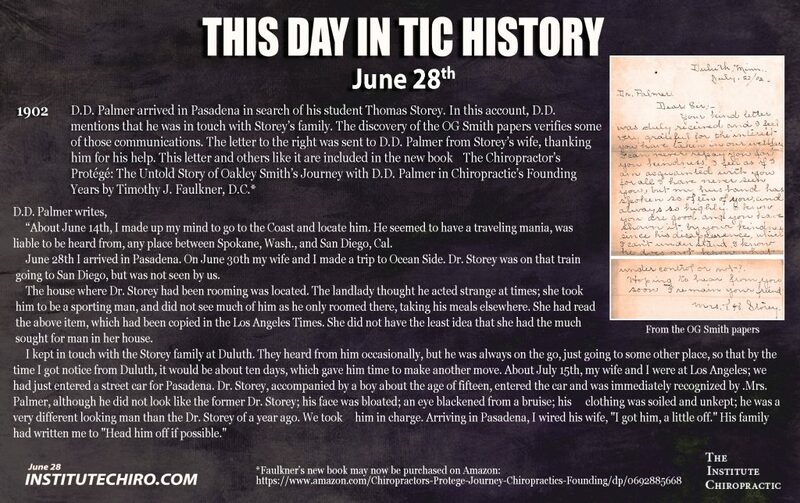 The Chiropractor’s Protégé: The Untold Story of Oakley G. Smith’s Journey with D.D. 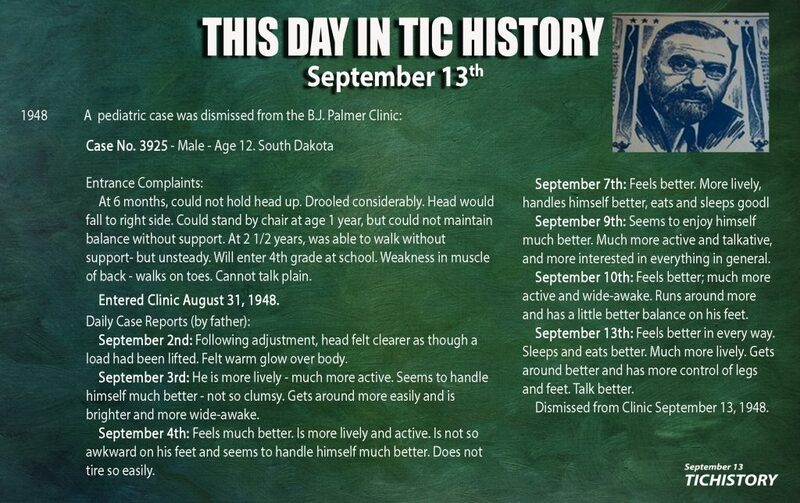 Palmer in Chiropractic’s Founding Years. 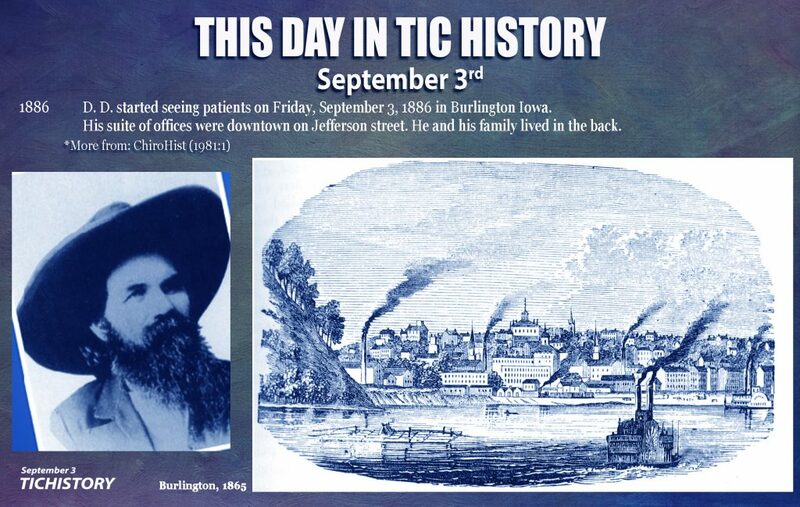 Rock Island, Ill: Association for the History of Chiropractic. Firth, J. 1914/1925. Chiropractic symptomatology. Vol. 7. 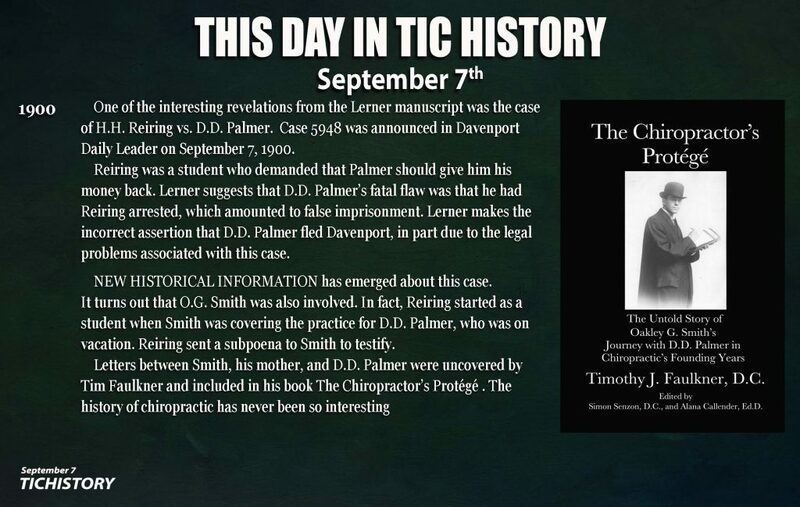 Davenport: Palmer College of Chiropractic. Forster, A. 1915. Principles and practice of spinal adjustment. Chicago, IL: National School of Chiropractic. Forster, A. 1921. 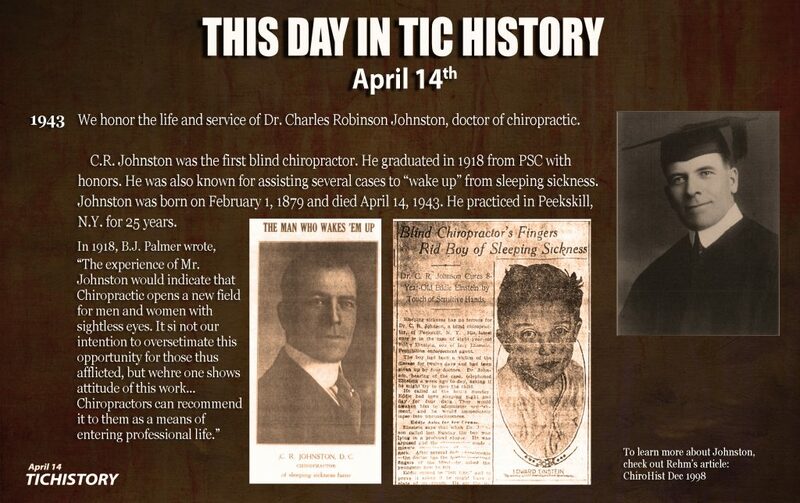 The white mark: An editorial history of chiropractic. Chicago: National Publishing Association. Forster, A. 1923. Principles and practice of chiropractic. Chicago: The National Publishing Association. Gatterman, MI. 1982. “WA Budden: the transition through proprietary education, 1924-1954.” Chiropr Hist no. 2 (1):21. Gaucher-Peslherbe, P. 1993. 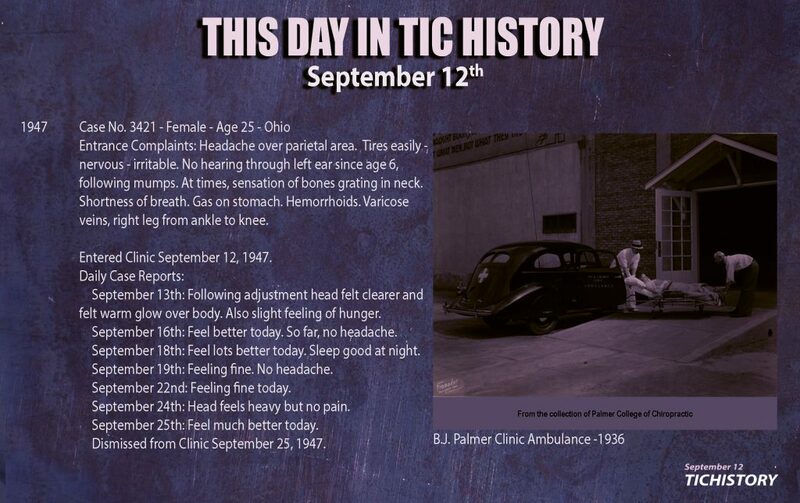 Chiropractic: Early concepts in their historical setting. In. Chicago: National College of Chiropractic. Geilow, V. 1982. Old dad chiro: A biography of D.D. 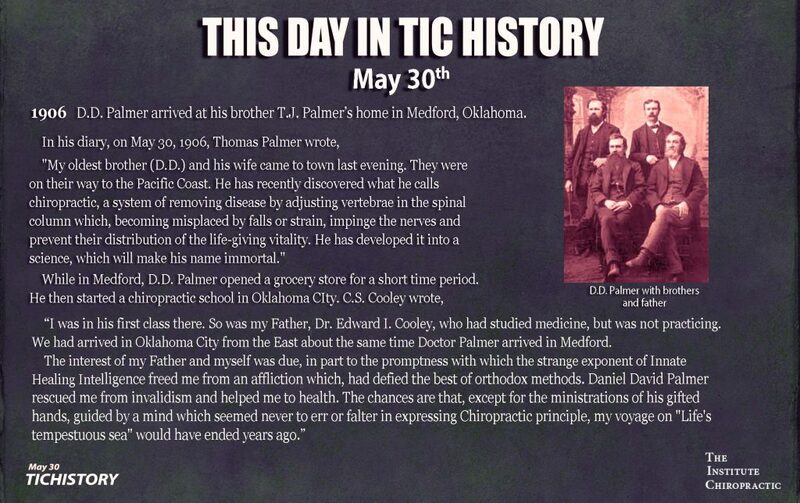 Palmer founder of chiropractic. La Crosse (WI): Fred Barge. Gelardi, T. 1996. “The science of identifying professions as applied to chiropractic.” J Chiropr Hum no. 6:11-17. Gibbons, R. 1980. “The rise of the chiropractic educational establishment: 1897-1980.” In Who’s who in chiropractic international, edited by F Lints-Dzaman, S Scheider and L Schwartz. Littleton, CO: Who’s Who in Chiropractic International Pub. Co.
Gibbons, R. 1985. 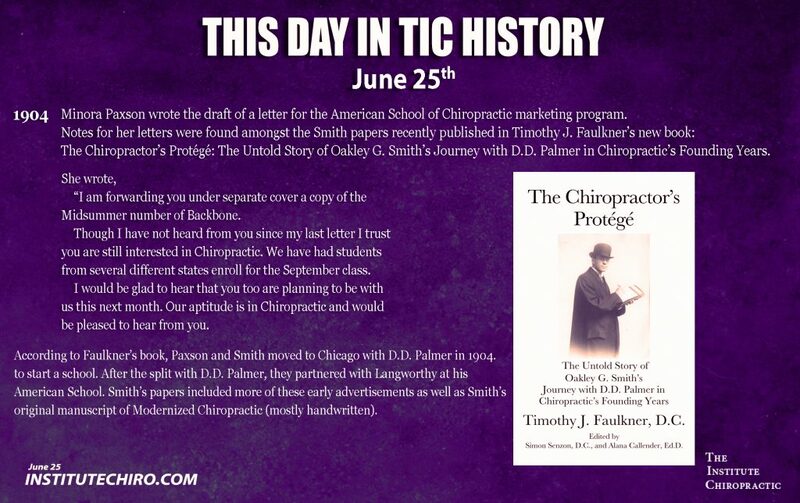 “Chiropractic’s Abraham Flexner: the lonely journey of John J. Nugent, 1935-1963.” Chiropr Hist no. 5:44-51. Gibbons, R. 1991. 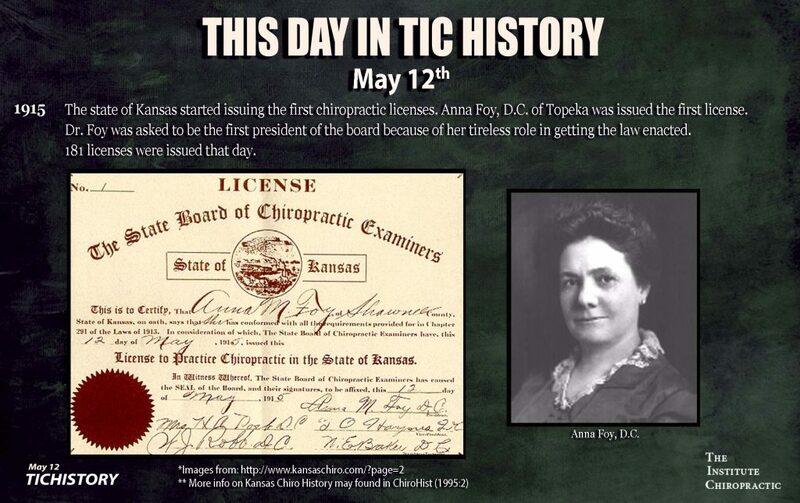 “Joy Loban and Andrew P. Davis: itinerant healers and “schoolmen,” 1910-1923.” Chiropr Hist no. 11 (1):23. Goldstein, M. 1975. The research status of spinal manipulative therapy: A workshop held at the National Institutes of Health, February 2-4, 1975. Vol. 15. Bethesda: U.S. Department of Health, Education, and Welfare. Green, B, M Mostashari, and T Trafecanty. 1994. 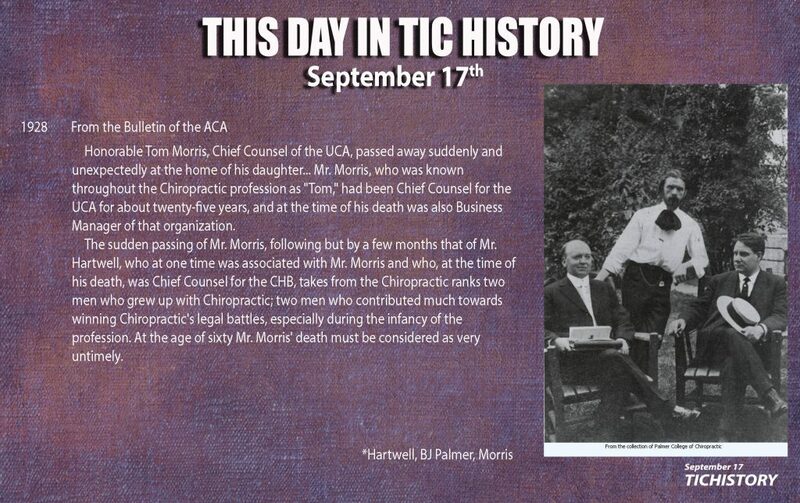 “Tom Morris: Chiropractic Advocate and Friend of Drugless Healers.” Chiropr Hist no. 14 (1):36. Harper, WD. 1997. Anything Can Cause Anything: A Correlation of Dr. Daniel David Palmer’s Priniciples of Chiropractic: Texas Chiropractic College. Hart, JF. 1996. 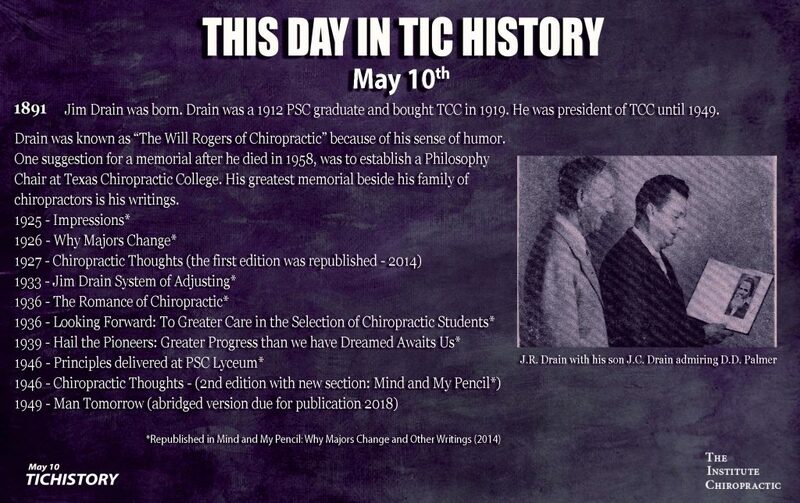 “Remembering Dr. Lyle Wheeler Sherman.” Chiropr Hist no. 16 (2):67-75. Howard, J. 1908. 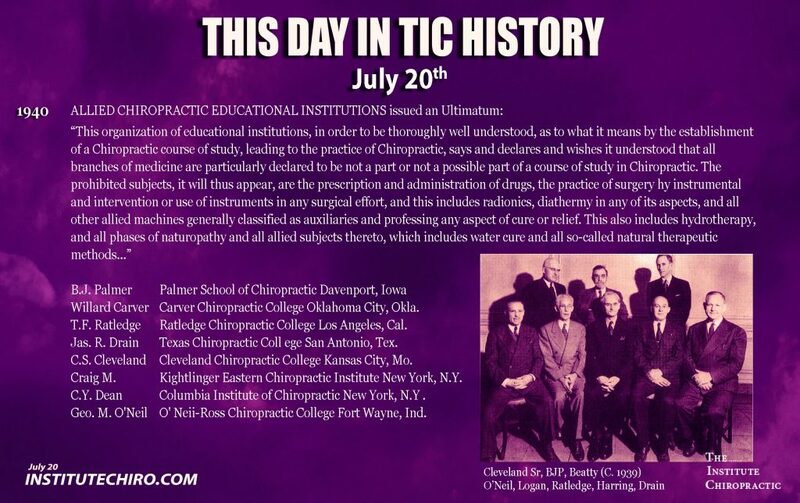 Encyclopedia of chiropractic (The Howard System): National School of Chiropractic. Janse, J. 1975. 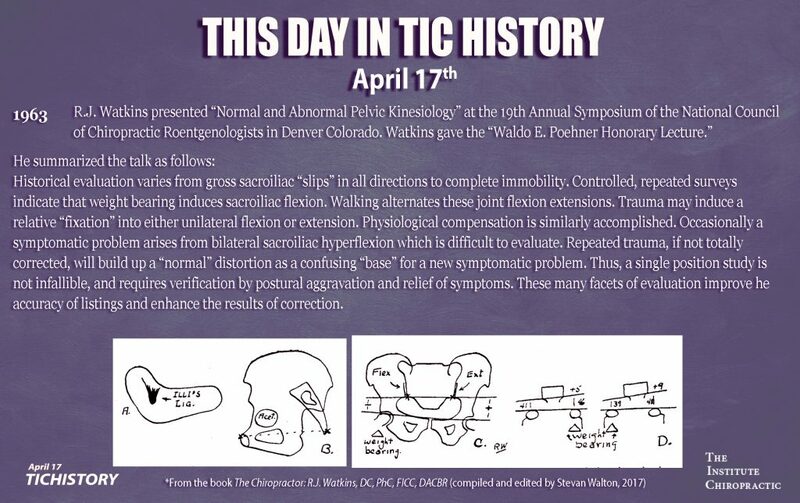 “History of the development of chiropractic concepts: Chiropractic terminology.” In The research status of spinal manipulative therapy: A workshop held at the National Institutes of Health, February 2-4, 1975, edited by M Goldstein, 25-42. Bethesda: U.S. Department of Health, Education, and Welfare. Keating, J. 1988. “C.O. 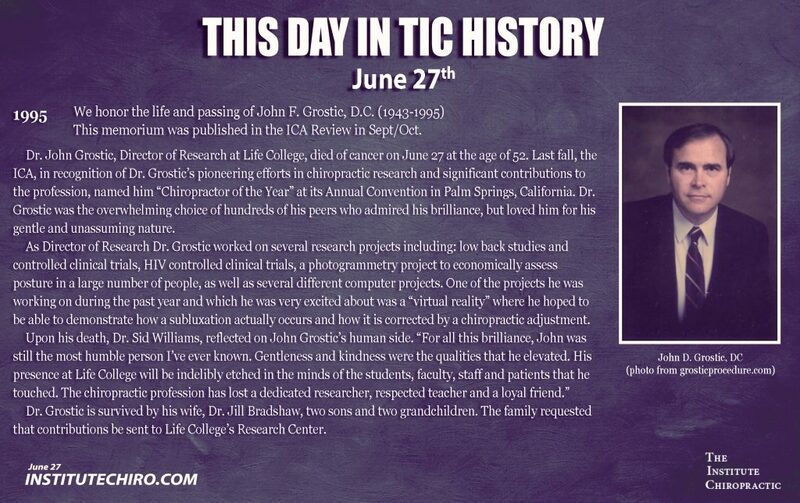 Watkins, D.C.: Grandfather of the Council on Chiropractic Education.” Journal of Chiropractic Education no. 2 (3):1-9. Keating, J. 1992a. 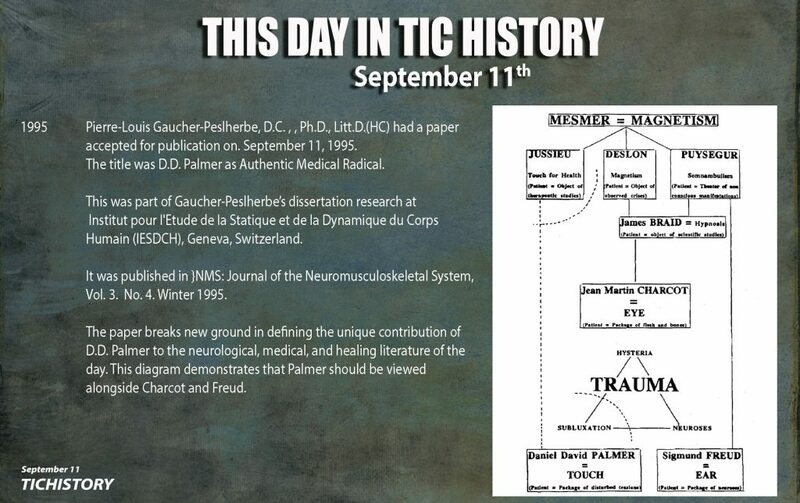 “The evolution of Palmer’s metaphors and hypotheses.” Philosophical Constructs for the Chiropractic Profession no. 2 (1):9-19. Keating, J. 1992b. Toward a philosophy of the science of chiropractic: A primer for clinicians. Stockton (CA): Stockton Foundation for Chiropractic Research. Keating, J. 1998. 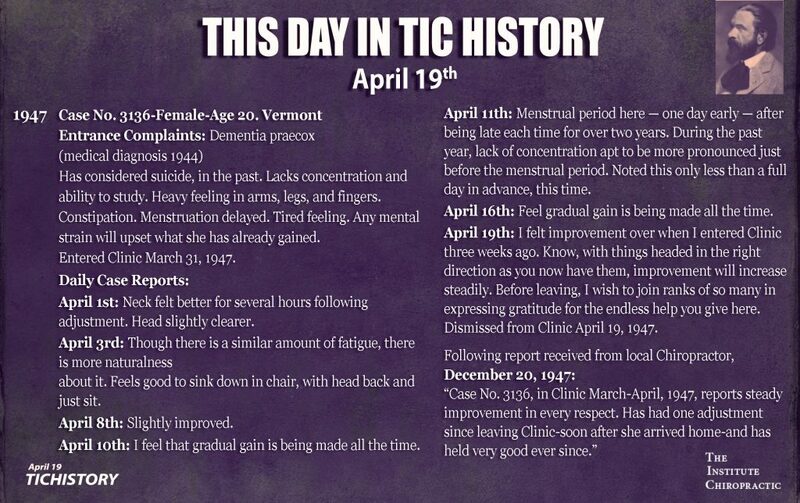 “Chronology of Alva Gregory, M.D., D.C.“. Keating, J. 2000a. 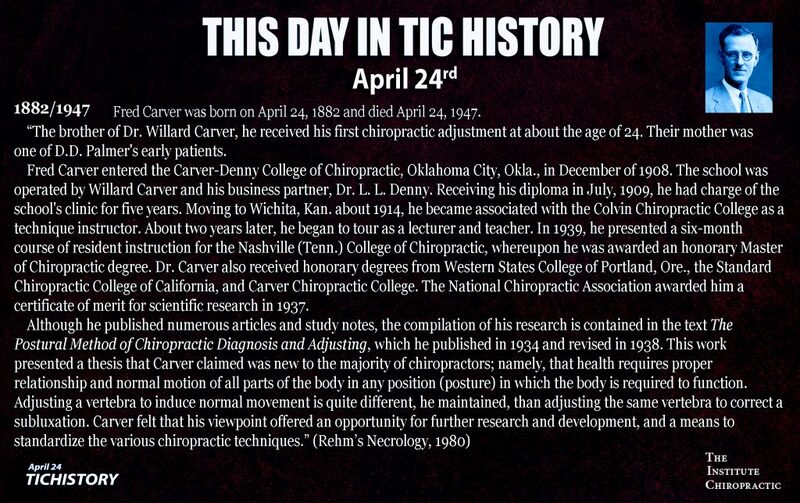 “Clarence W. Weiant, D.C., PH.C., PH.D.: An early chiropractic Scholar.” Chiropr Hist no. 20 (2):49-79. Keating, J. 2000b. 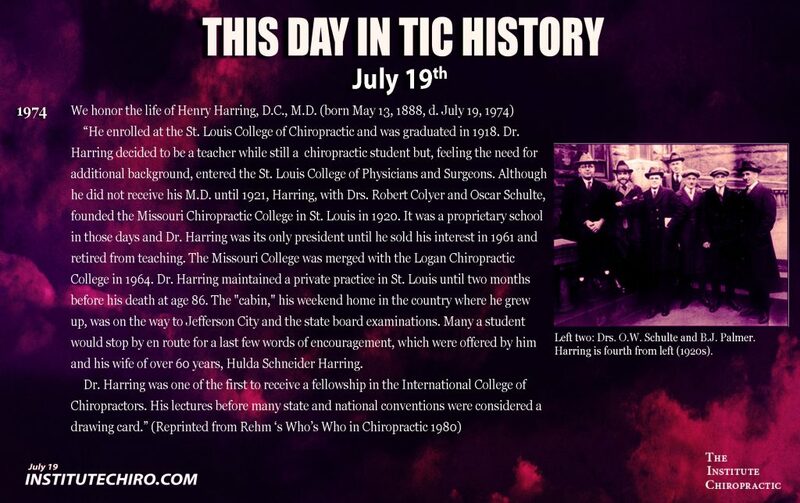 “The search for a science of straight chiropractic: Herbert Marshall Himes.” Dynamic Chiropractic no. 18 (26):30-2. Keating, J, ed. 2003. D.D. 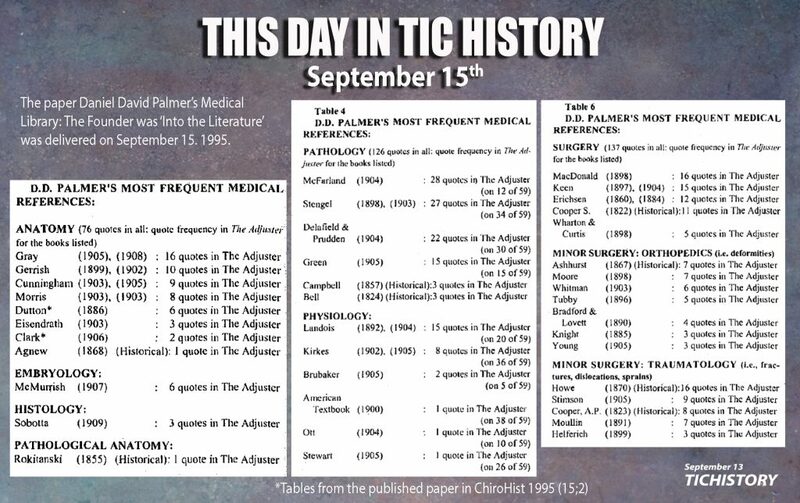 Palmer’s Early Chiropractic Writings 1896-1902. Keating, J. 2005. “Philosophy in chiropractic.” In Principles and practice of chiropractic, edited by S Haldeman, 77-97. New York: McGraw Hill Companies, Inc.
Keating, J. 2008. 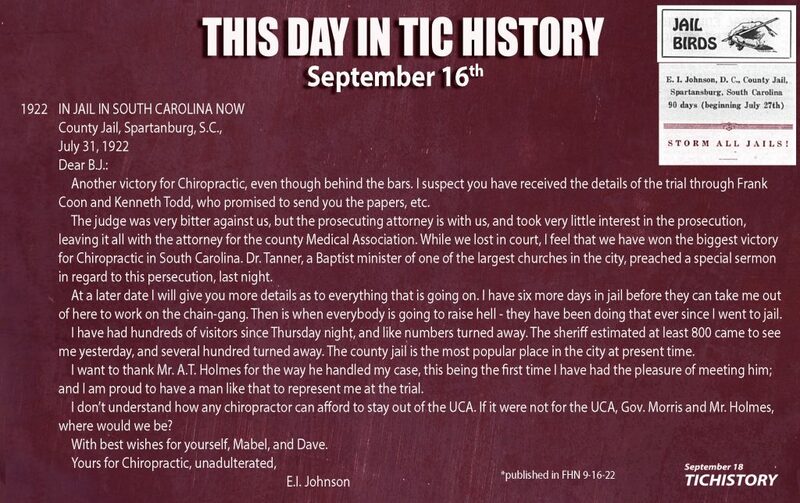 “William D. Harper, Jr, MS, DC: Anything Can Cause Anything.” J Can Chiropr Assoc no. 52 (1):38. Keating, J, R Brown, and P Smallie. 1991. “T.F. 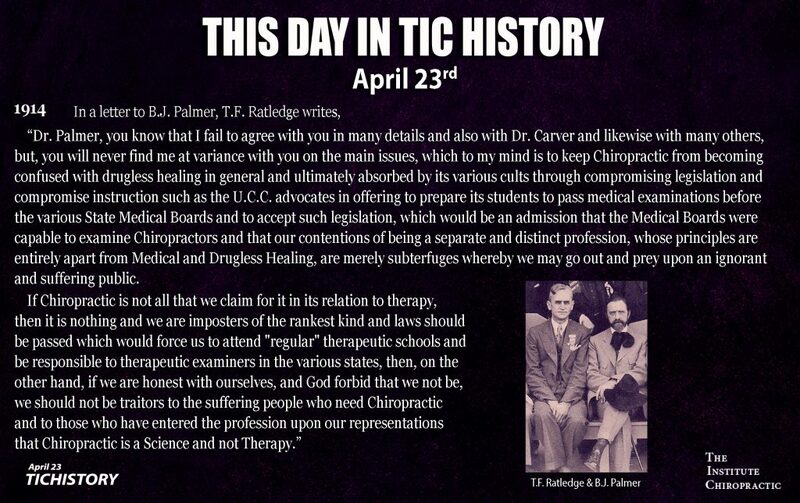 Ratledge, the missionary of straight chiropractic in California.” Chiropr Hist no. 11 (2):27-38. Keating, J, R Brown, and P Smallie. 1992. 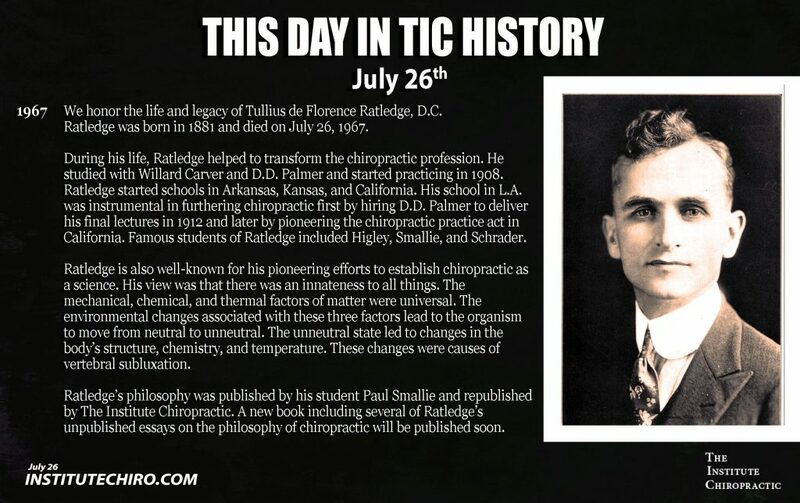 “One of the roots of straight chiropractic: Tullius de Florence Ratledge.” In Chiropractic family practice: A clinical manual, edited by J Sweere. Gaithersburg, MD: Aspen Publishers, Inc.
Keating, J, A Callender, and C Cleveland. 1998. 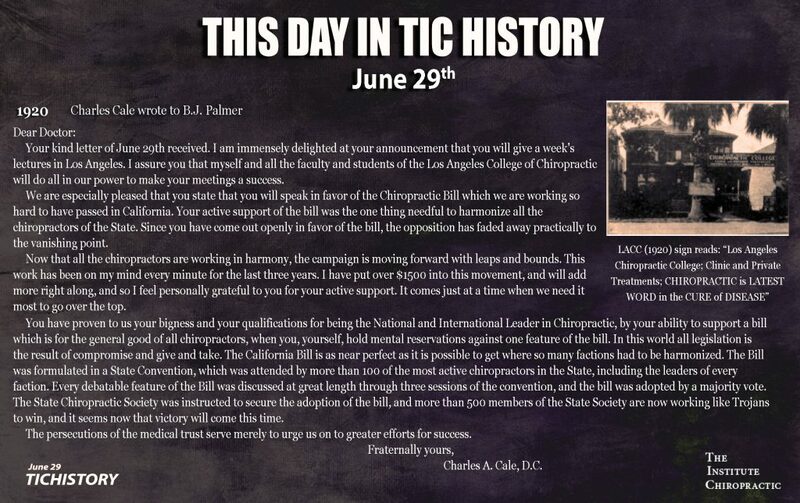 A history of chiropractic education in North America. 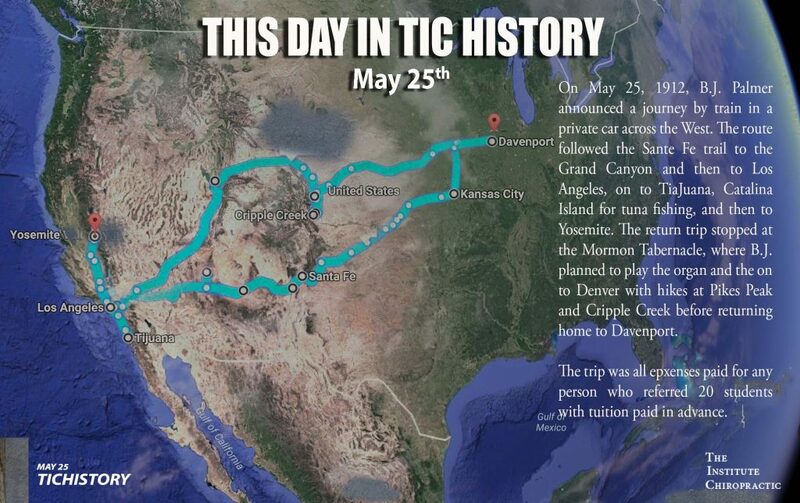 Davenport, IA: Association for the History of Chiropractic. Keating, J, K Charlton, J Grod, S Perle, D Sikorski, and J Winterstein. 2005. “Subluxation: dogma or science.” Chiropractic & Osteopathy no. 13 (17). Keating, J, and W Rehm. 1995. 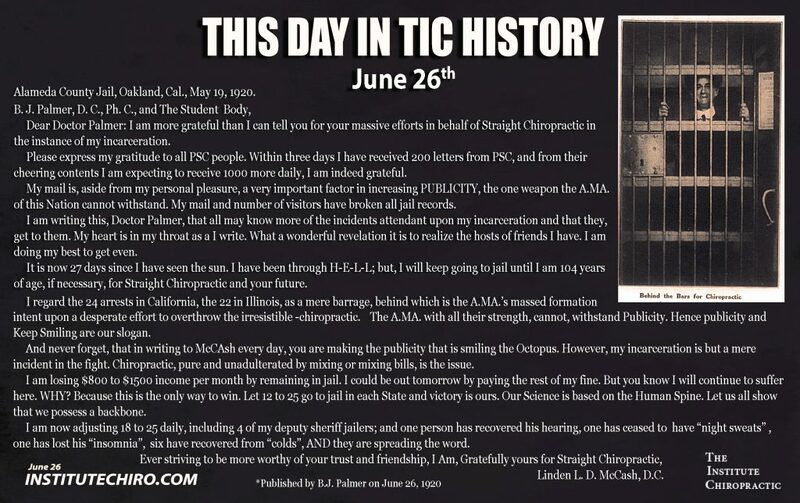 “William C. Schulze, MD, DC (1870-1936): From mail-order mechano-therapists to scholarship and professionalism among drugless physicians.” Chiropractic Journal of Australia no. 25:122-128. Keating, J, and S Troyanovich. 2005. 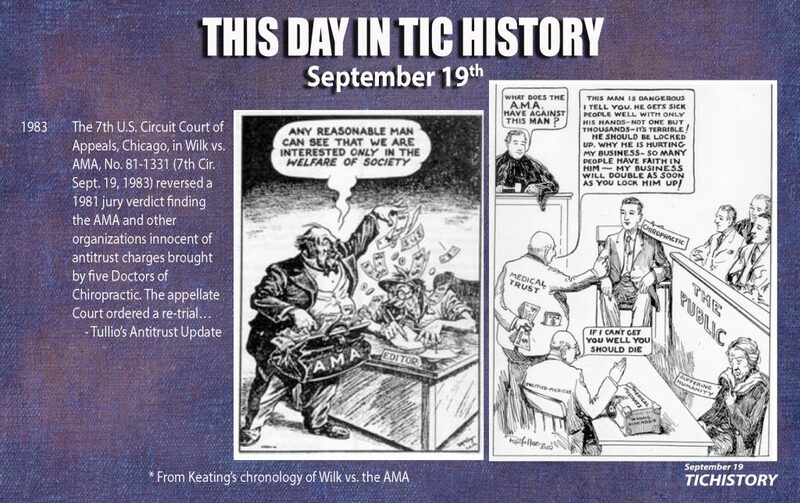 “Wisconsin versus chiropractic: the trials at LaCrosse and the bilth of a chiropractic champion.” Chiropr Hist no. 25 (1):37-45. Kent, C. 2013. 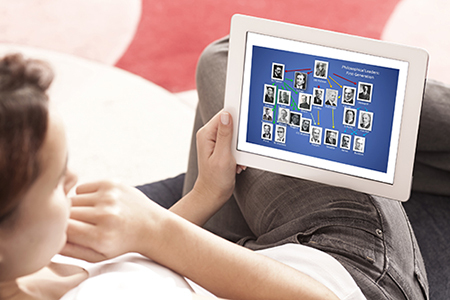 Chiropractic Insights: eBookIt. com. Koch, D. 1997. “Has vitalism been a help or a hindrance to the science and art of chiropractic?” J Chiropr Humanit no. 6:18-22. Langworthy, SM. 1903. “The science of chiropractic.” Backbone no. 1 (1). 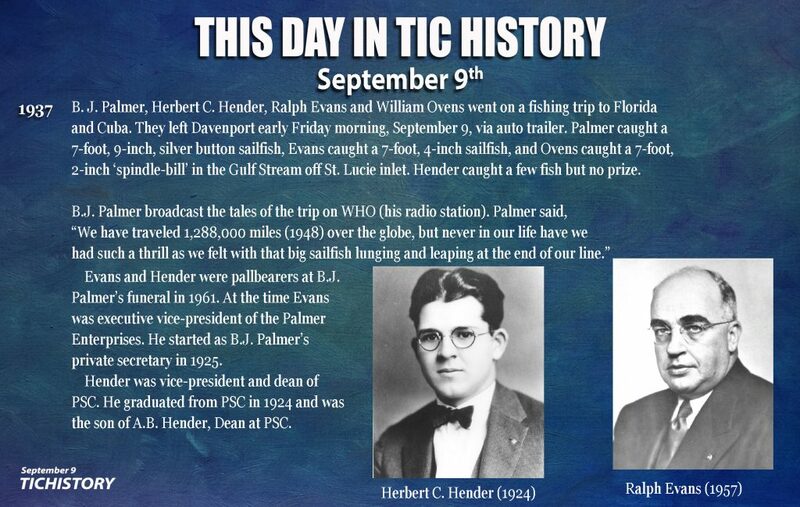 Leach, R, and R Phillips. 2004. Philosophy: Foundation for theory development. Edited by R Leach. 4 ed, The chiropractic theories: A textbook of scientific research. Philadelphia (PA): Lippincott Williams & Wilkins. Loban, J. 1908. 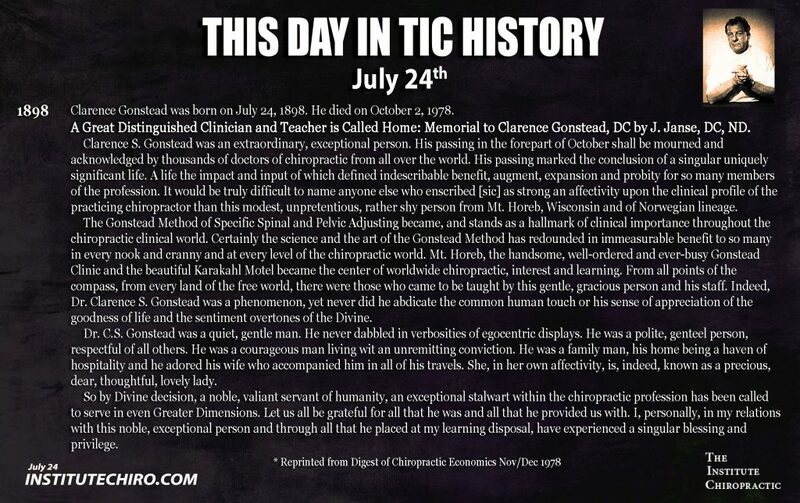 “The completeness of chiropractic philosophy.” The Chiropractor no. 4 (7 &8):30-35. Loban, J. 1911. “Chiropractic Reasoning.” International Chiropractic Journal no. 1 (1). McAulay, B. 2005. “Rigor in the philosophy of chiropractic: Beyond the dismissivism/authoritarian polemic.” J Chiropr Humanit no. 12:16-32. Moore, L, and L Wise. 1978. “A report on chiropractic politics & education.” In, edited by KS Armstrong. Altanta: Chiropractic Foundation of America. Moore, S. 1993. 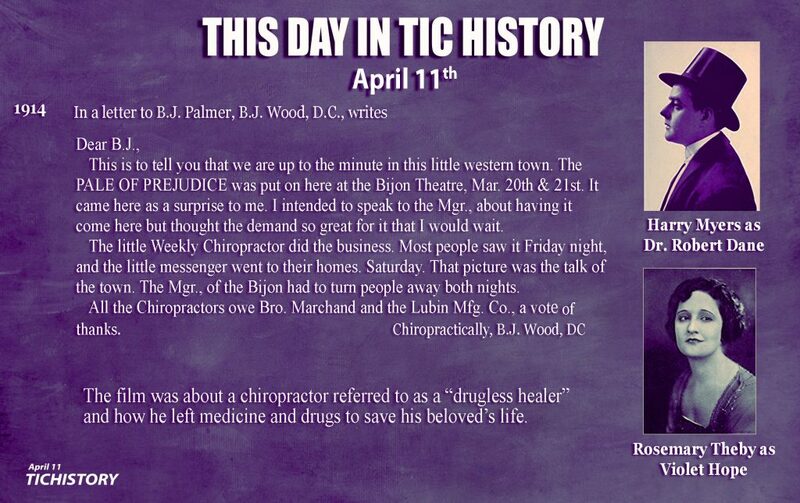 Chiropractic in America: The history of a medical alternative: Johns Hopkins University Press. Morikubo, S. 1907. “Chiropractic.” LaCross Leader. Morikubo, S. 1915. “Chiropractic Philosophy.” The Chiropractor no. 11 (5):13-17. Nugent, J. 1941. Chiropractic education: Outline of a standard course. Department of Education National Chiropractic Association. Palmer, B..J. . 1934. The subluxation specific the adjustment specific; Vol. 18. In. Davenport. 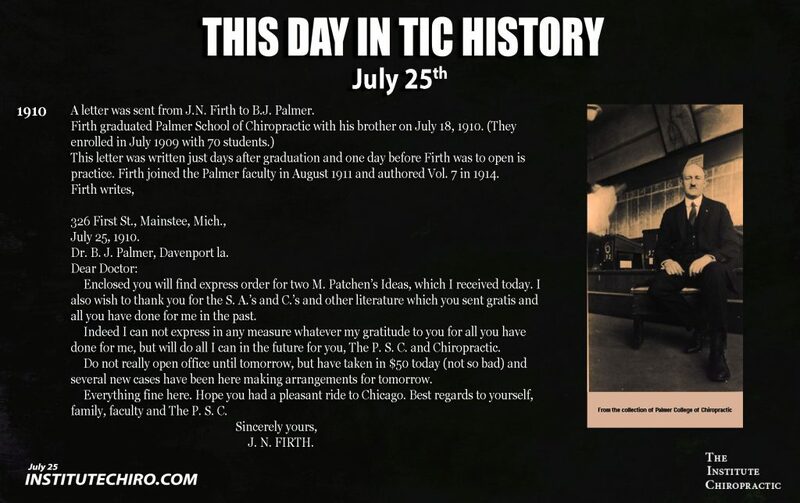 IA: Palmer College. Palmer, B.J. 1907. The science of chiropractic: Eleven physiological lectures; Volume 2. Davenport, IA: The Palmer School of Chiropractic. Palmer, B.J. 1909. Philosophy of chiropractic: Vol. 5. 1st ed. 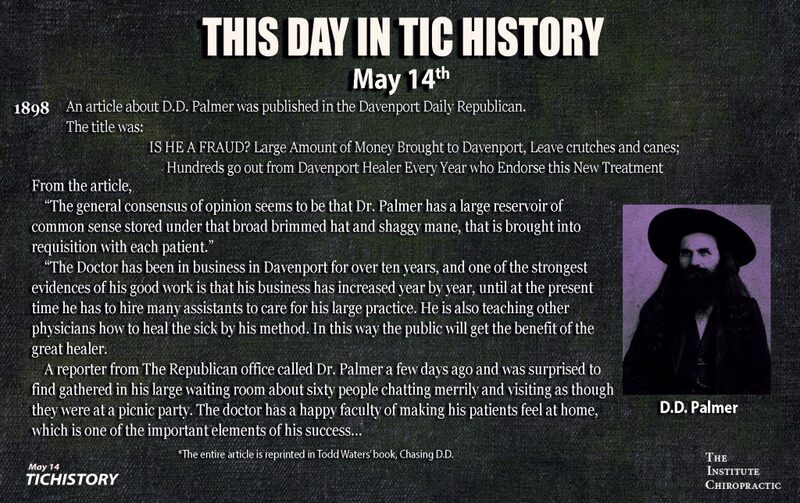 Davenport: Palmer School of Chiropractic. Palmer, B.J. 1911a. The philosophy and principles of chiropractic adjustments: A series of thirty eight lectures: Vol. 3. Davenport, IA: Palmer College. Palmer, B.J., ed. 1921. 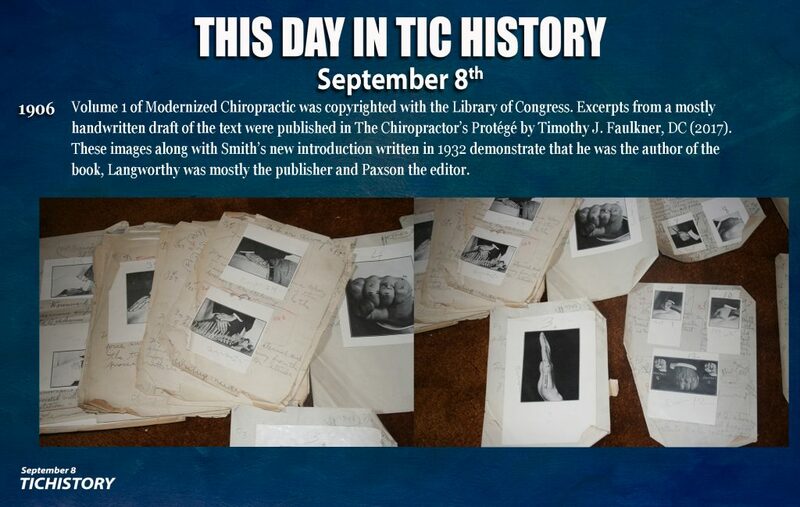 The Chiropractic Adjuster; A compilation of the writings of D.D. Palmer: Vol. 4. Davenport, IA: Palmer School of Chiropractic. Palmer, B.J. . 1911b. The philosophy, science, and art of chiropractic nerve tracing: A book of four sections; Vol. 6, Volume 6. 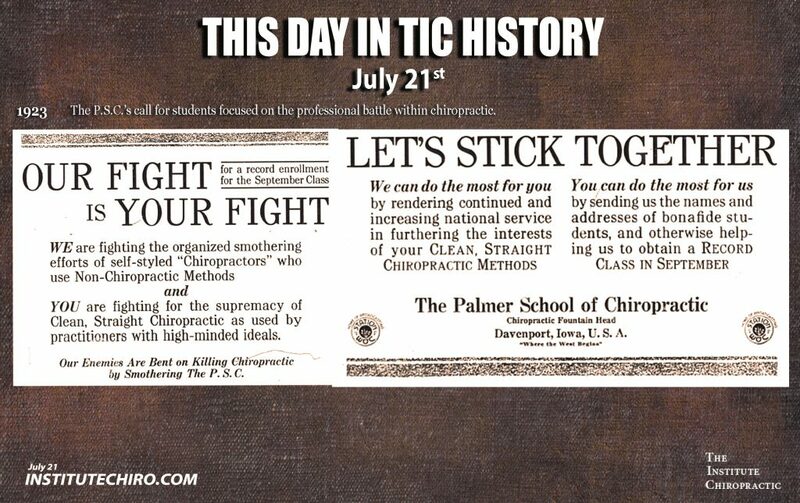 Davenport, IA: Palmer School of Chiropracitc. Palmer, B.J. . 1920. The Science of Chiropractic: Containing a series of lectures and other scientific material discovered or developed and delivered. Davenport, IA: The Palmer School of Chiropractic. 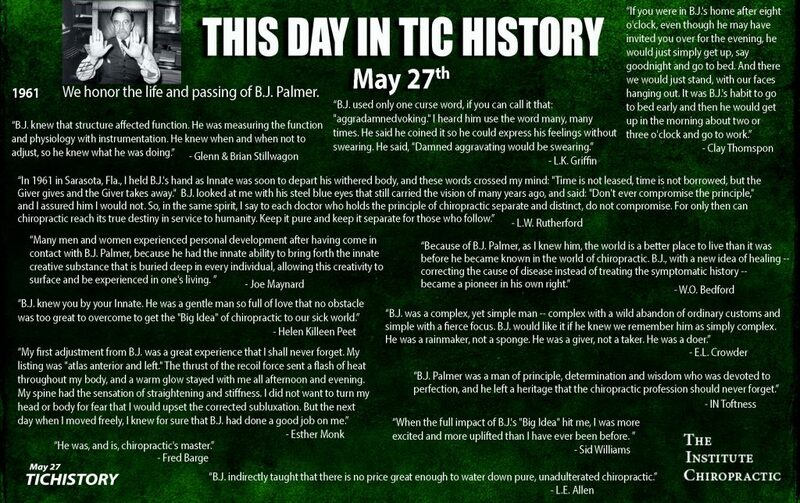 Palmer, B.J. . 1929/2011. The Great Undertow. Edited by H.T. Hughes. Raleigh, NC: Lulu. Palmer, B.J. . 1938. Precise, posture-constant, spinograph, comparative graphs; Vol. 20. Davenport, IA: Palmer School of Chiropractic. Palmer, B.J. . 1951. Clinical controlled chiropractic research; Vol. 25. 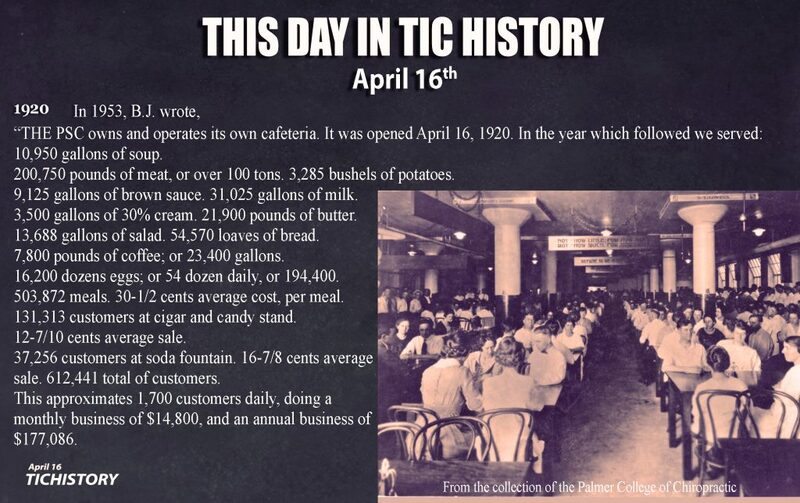 Davenport, IA: Palmer College. Palmer, B.J., and J Craven. 1916. The philosophy of chiropractic: Vol 5. In. Davenport, IA: Palmer College of Chiropractic. Palmer, BJ. 1936. The known man or an explanation of the “phenomenon of life”; vol. 19. Davenport, IA: Palmer College. Palmer, D.D. 1902a. “Is chiropractic an experiment? 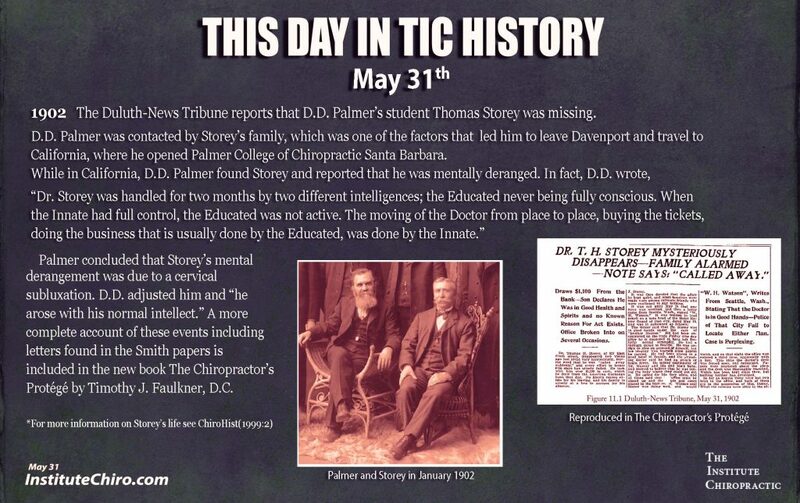 .” The Davenport Times no. June 14. Palmer, D.D. 1902b. “Letter to B.J. Palmer.” no. April 27. Palmer, D.D. 1910. The science, art, and philosophy of chiropractic. Portland, OR: Portland Printing House. Palmer, D.D. 1914. The Chiropractor. Los Angeles: Press of Beacon Light Printing Company. Palmer, D.D., and B.J. Palmer. 1906. The science of chiropractic. Davenport, Iowa: The Palmer School of Chiropractic. Palmer, M. 1923. Chiropractic Anatomy. 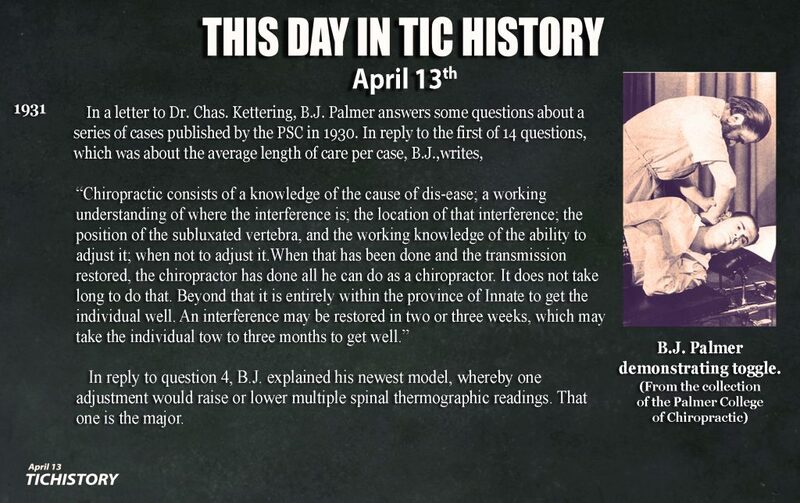 Davenport: Palmer College of Chiropractic. Peters, R. 2014. 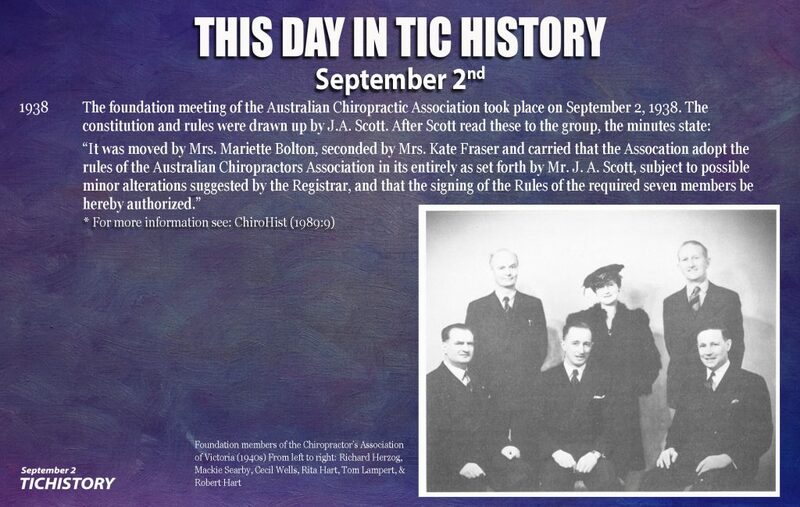 An early history of chiropractic: The Palmers and Australia. Asheville, NC: Integral Altitude. Peters, R, and M Chance. 2007. 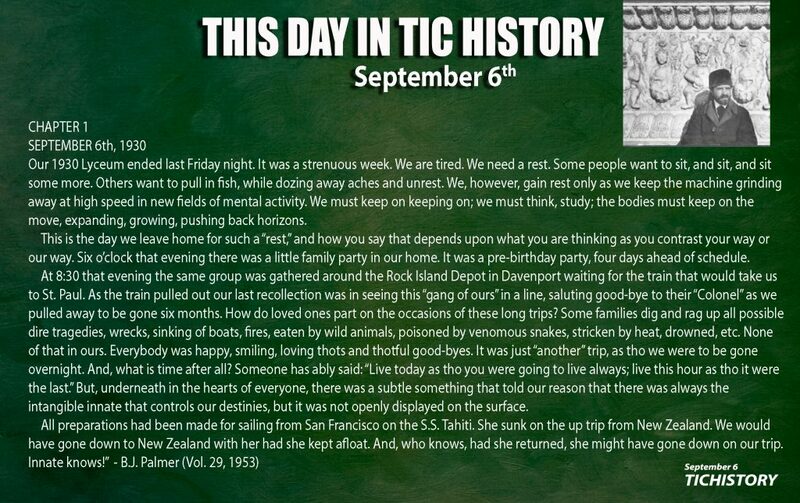 “Disasters, discoveries, developments, and distinction: The year that was 1907.” Chiropr J Aust no. 37:145-156. Petersen, A.R., R.J. Watkins, and M Himes. 1966. Segmental neuropathy: the first evidence of developing pathology: Canadian Memorial Chiropractic College. Phillips, R. 1997. “Division of the vision.” Dynamic Chiropractic no. 15 (15). Phillips, R. 2004. “The battle for innate: A perspective on fundamentalism in chiropractic.” J Chiropr Humanit no. 11:2-8. Phillips, R. 2005. “The evolution of vitalism and materialism and its impact on philosophy in chiropractic.” In Principles and practice of chiropractic, edited by S Haldeman, 65-75. New York: McGraw Hill Companies, Inc.
Phillips, R. 2006. 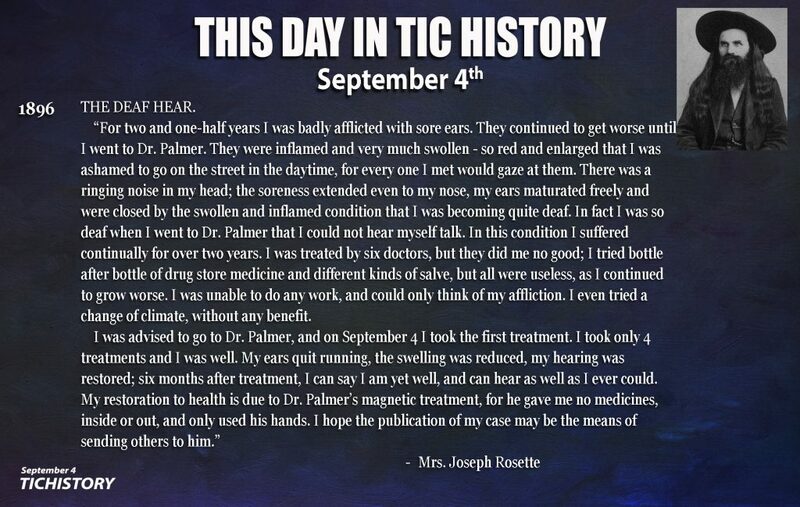 Joseph Janse: The apostle of chiropractic education. Los Angeles: R. Phillips. Phillips, R, I Coulter, A Adams, A Traina, and J Beckman. 1994. “A contemporary philosophy of chiropractic for the LACC.” J Chiropr Humanit no. 4:20-25. Quigley, W. 1989. 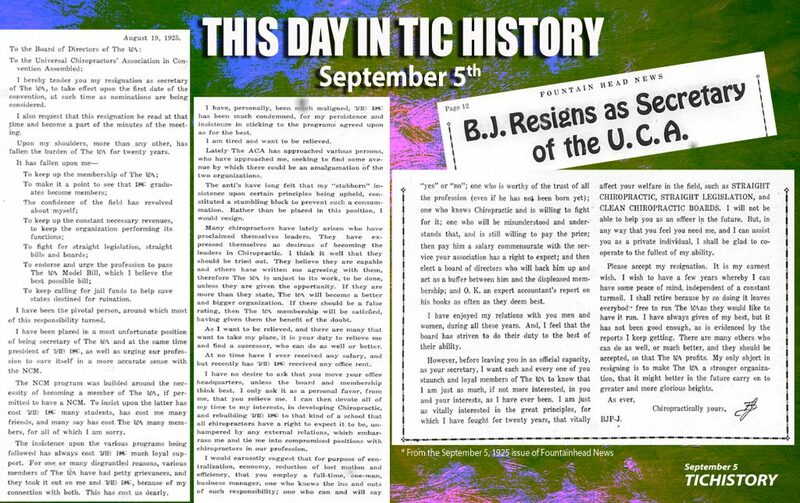 “The last days of B.J. Palmer: Revolutionary confronts reality.” no. 9 (2):11-19. Ratledge, TF. 1949. The philosophy of chiropractic. Los Angeles, CA: Ratledge. Rehm, W. 1998. 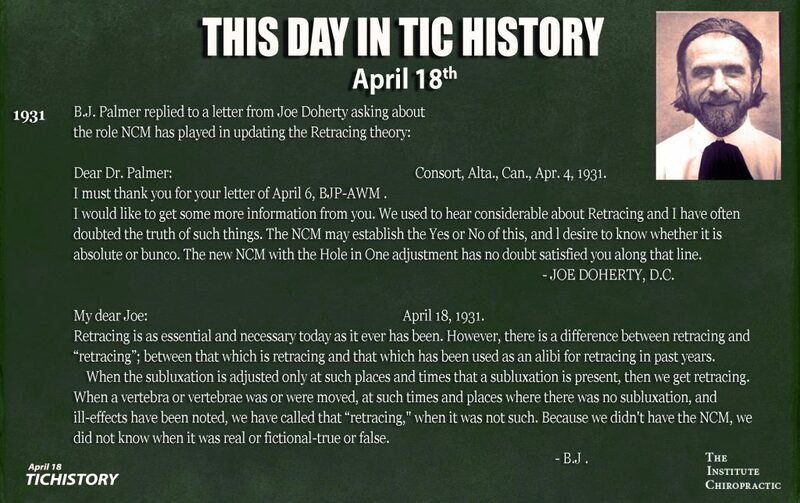 “Remembering Tom Morris.” J Chiropr Hum no. 8 (1):67-70. Riley, S. 1919. Science and practice of chiropractic with allied sciences. Washington: J.S. Riley. Russell, E. 2009. “Process versus outcome: challenges of the chiropractic wellness paradigm.” J Chiropr Hum no. 16 (1):50-53. Senzon, S. 2010a. “B.J. Palmer: An integral biography.” Journal of Integral Theory and Practice no. 5 (3):118-136. Senzon, S. 2010b. “Constructing a philosophy of chiropractic I: an Integral map of the territory.” J Chiropr Human no. 17 (17):6-21. Senzon, S. 2011a. “Constructing a philosophy of chiropractic: When worldviews evolve and modern foundation.” J Chiropr Humanit no. 18 (1):24-38. Senzon, S. 2011b. “Constructing a philosophy of chiropractic: When worldviews evolve and postmodern core.” J Chiropr Humanit no. 18 (1):39-63. Senzon, S. 2011c. “Constructing a philosophy of chiropractic: When worldviews evolve and Premodern roots.” J Chiropr Humanit no. 18 (1):10-23. Senzon, S. 2014. “Chiropractic professionalism and accreditation: An exploration of conflicting worldviews through the lens of developmental structuralism.” J Chiropr Hum no. 21 (1):25-48. Senzon, S. 2015. “Chiropractic and systems science.” Chiropractic Dialogues no. December 25:9-20. Senzon, S. In Press. 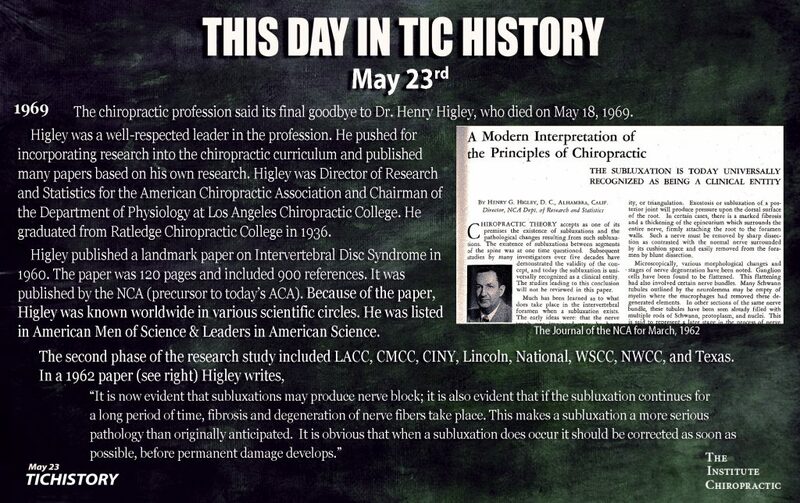 “The Chiropractic Subluxation Part 8: Terminology, Definitions, and Historicity from 1966-1980.” J Chiropr Hum. Senzon, SA. 1999. “Causation related to self-organization and health related quality of life expression based on the vertebral subluxation model, the philosophy of chiropractic, and the new biology.” J Vertebral Subluxation Res no. 3:104-112. Senzon, SA, D Epstein, and D Lemberger. 2011. “Reorganizational Healing as an integrally informed framework for Integral Medicine.” Journal of Integral Theory and Practice no. 6 (4):113-130. Sinnott, R. 1997. The Greenbooks: A collection of timeless Chiropractic works – by those who lived it! Mokena, IL: Chiropractic books. Sinnott, R. 2009. Sinnott’s textbook of chiropractic philosophy. Mokena, IL: Self published. Sinnott, R. 2016. Textbook Of Human Adaptability. Smallie, P. 1963. The guiding light of Ratledge: Self-published. Smallie, P. 1979a. Ratledge philosophy: Volume 1. Stockton, California: World-Wide Books. Smallie, P. 1979b. Ratledge philosophy: Volume II. Asheville, NC: Integral Altitude, Inc.
Smallie, P. 1984. Scientific chiropractic. Stockton, CA: World-Wide Books. Smallie, P. 1988. 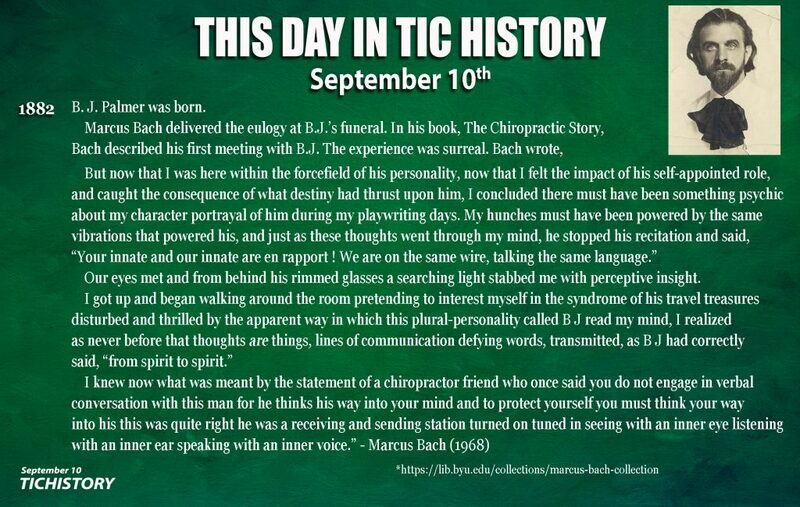 The opening of the chiropractic mind. Stockton, CA: World-Wide Books. Smith, O, S Langworthy, and M Paxson. 1906. A textbook of modernized chiropractic. Cedar Rapids (IA): American School of Chiropractic. Stephenson, RW. 1927. “Chiropractic textbook.” In. 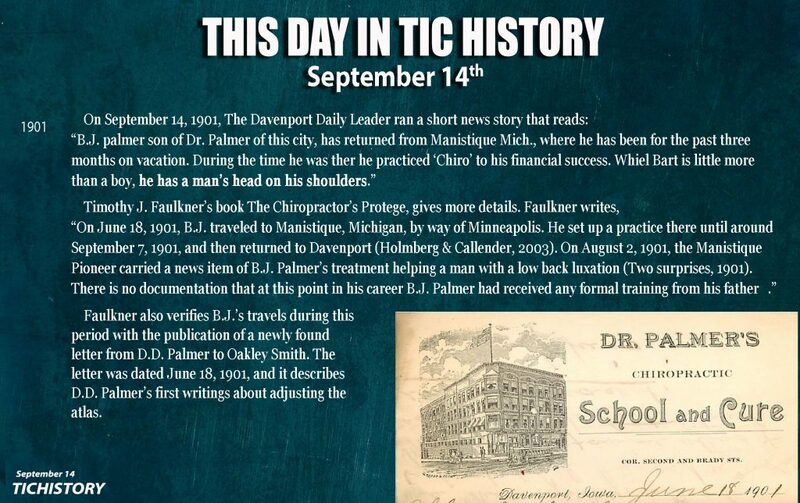 Davenport: Palmer School of Chiropractic. Strang, VV. 1984. “Essential Principles of Chiropractic.” In. Davenport: Palmer College of Chiropractic. Strauss, J. 1991. Chiropractic philosophy: Foundation for the Advancement of Chiropractic Education. Strauss, J. 1994. Refined by fire: The evolution of straight chiropractic. Levittown(PA): Foundation for the Advancement of Chiropractic Education. Vedder, H. 1922. Chiropractic Physiology. Vol. 8. Davenport: Palmer College of Chiropractic. Verner, JR, CW Weiant, and R.J. Watkins. 1953. Rational bacteriology. Peekskill, NY: Weiant. Villaneuva-Russell, Y. 2002. On the margins of the system of professions: Entrepreneurialism and professionalism as forces upon and within chiropractic. Dissertation, Graduate School, University of Missouri, Columbia, MO. Walton, S. 2017. 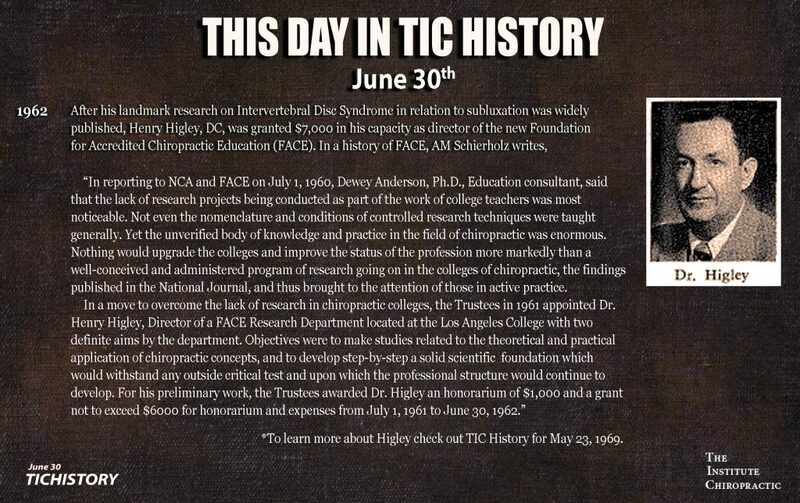 The complete chiropractor: RJ Watkins, DC, PhC, FICC, DACBR. Asheville, NC: The Institute Chiropractic. Watkins, CO. 1944. The basic principles of chiropractic government: National Institute of Chiropractic Research. WHO. 2005. WHO guidelines on basic training and safety in chiropractic: World Health Organization. Williams, S. 1994. Looking back to see ahead. Marietta, GA: Life College. Winterstein, J. 1994. “Philosophy of chiropractic: A contemporary perspective; (Pt 1).” ACA J of Chiropr. Winterstein, J, R Jones, D Radford, D Seaman, and D Richardson. Chiropractic physicians and primary care. 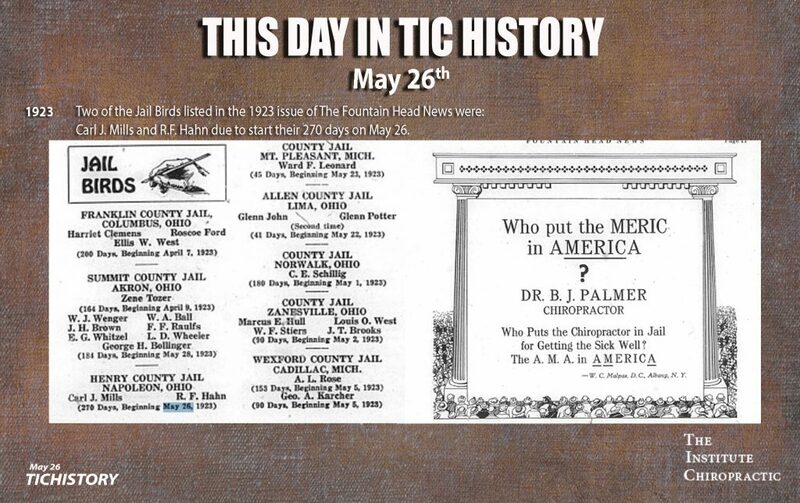 American Chiropractic Association 2012 [cited April 25, 2012. Zarbuck, MV. 1986. 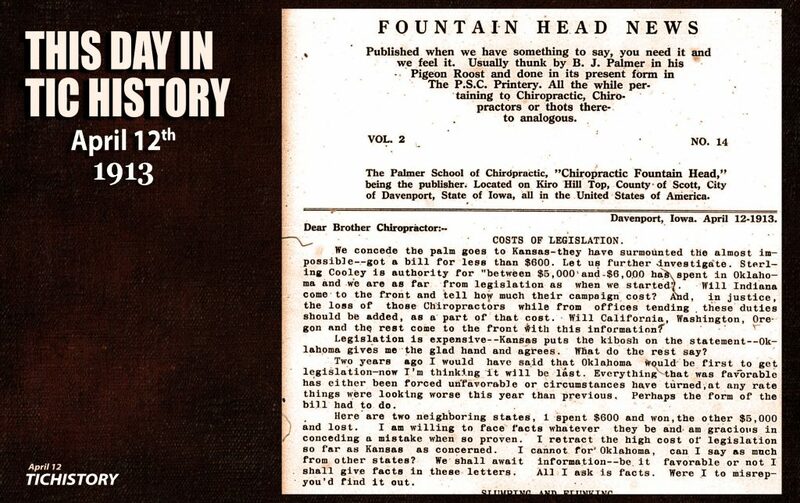 “A profession for ‘Bohemian Chiropractic’: Oakley Smith and the Evolution of Naprapathy.” Chiropr Hist no. 6:77-82. Zarbuck, MV. 1987. “Innate Intelligence (Part 1).” Illinois Prairie State Chiropractors Association Journal of Chiropractic no. 8 (4):12-13. Zarbuck, MV. 1988a. “Chiropractic Parallax: Part 1.” Illinois Prairie State Chiropractors Association Journal of Chiropractic no. January. Zarbuck, MV. 1988b. 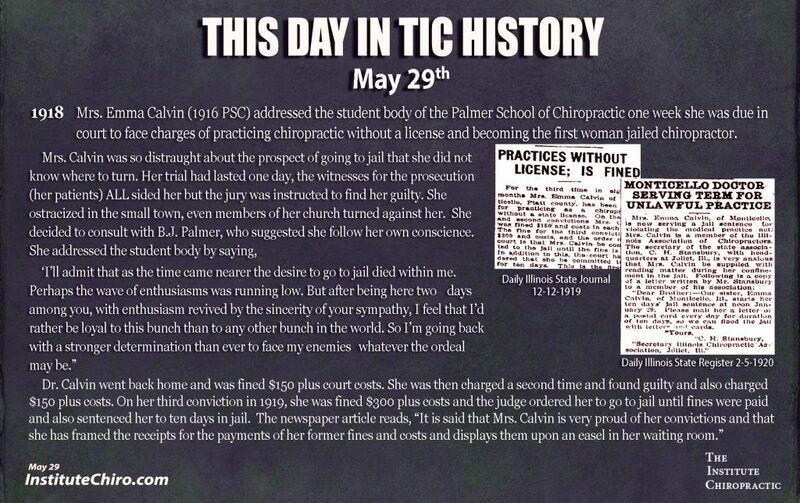 “Chiropractic Parallax: Part 2.” Illinois Prairie State Chiropractors Association Journal of Chiropractic. Zarbuck, MV. 1988c. “Chiropractic Parallax: Part 3.” Illinois Prairie State Chiropractors Association Journal of Chiropractic no. July. Zarbuck, MV. 1988d. “Chiropractic Parallax: Part 4.” Illinois Prairie State Chiropractors Association Journal of Chiropractic no. October. Zarbuck, MV. 1988e. “Innate Intelligence (Part 2).” Illinois Prairie State Chiropractors Association Journal of Chiropractic no. 9 (1):11,16. Zarbuck, MV. 1989a. “Chiropractic Parallax: Part 5.” Illinois Prairie State Chiropractors Association Journal of Chiropractic no. January. Zarbuck, MV. 1989b. “Chiropractic Parallax: Part 6.” Illinois Prairie State Chiropractors Association Journal of Chiropractic no. October. 2000. “In memoriam: Galen R. Price 1912-2000.” Chiropr J Aust no. 30 (1):29. 2001. “WFC philosophy meeting produces new international consensus.” Dynamic Chiropractic no. 19 (1).